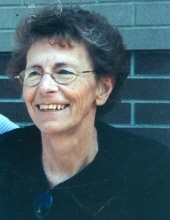 Cynthia “Cindy” Martin, 71, of Port Clinton, OH, passed away, Monday, April 08, 2019, at Riverview Healthcare Campus, Oak Harbor, OH. Cindy was born on November 17, 1947 in Port Clinton, the daughter of Raymond A. and Lois I. (Diedrich) Wood. She was a 1965 graduate of Port Clinton High School. Cindy worked at Drawbridge Marina as a customer service specialist for 25 years. She was raised Catholic at Immaculate Conception Catholic Church and attended Immaculate Conception School. Cindy loved animals, crafts and needlework, especially crocheting. Those left to cherish her memory are: Son: Denny (Tina Manning) Robel; Daughter: Angie (Jason) Campbell; Grandchildren: Zayne, Zavier and Zyler Manning; Sister: Holly (Kevin) Brawley; Aunts: Ila Rose Griffin, Marilyn Smith and Phyllis (Bud) Frampton; First Husband: Denny (Darlene) Robel Sr.; Niece: Andrea (Scott) Baker; Nephews: Sean (Whitney) Brawley and James (Kristin) Brawley & sons. Cindy was preceded in death by her parents and second husband, William Martin. A Memorial service will be celebrated by Father John Missler at 10:00am, Saturday, April 13, 2019, at Immaculate Conception Catholic Church, Port Clinton, OH. Burial will be in Oakwood Cemetery, Fremont, OH. Memorial contributions may be given to the Ottawa County Humane Society, 2424 E. Sand Rd, Port Clinton, OH 43452. Gerner-Wolf-Walker Funeral Home assisted the family with arrangements. To send flowers or a remembrance gift to the family of Cynthia "Cindy" Martin, please visit our Tribute Store. "Email Address" would like to share the life celebration of Cynthia "Cindy" Martin. Click on the "link" to go to share a favorite memory or leave a condolence message for the family.